Nuclear-powered electrostatic acceleration [Bussard and DeLauer, 1958, p. 330; Sutton, 1992] is essentially that in commercial ion engines: an applied voltage creates an electrostatic field, and the Coulomb force accelerates electrically charged (ionized) propellant. With nuclear power, the only conceptual difference is in the larger voltages and power one can afford. What is known about ion engines tells that thrust is limited by space charge, breakdown voltage and size of engine exit cross-section (power density, or thrust density, W/m2 and N/m2, respectively). For instance, a commercial ion thruster has a thrust density of about 1 N/m2 to 2 N/m2. Even so, 1-MW prototypes have been built and laboratory-tested [Fearn, 2003]. Performance has been extrapolated with scaling laws at input power up to about 6 MW [Fearn, 2004]. The results indicate thrust density may reach about 300 N/m2, a rather respectable figure, with Isp of order 30,000 s. The thrust/power ratio is about 6,900 N/MW. For comparison, a NTR has a ratio three to four times larger, but of course with an Isp about 30 times lower. A comprehensive description of this propulsion technology can be found in [Fearn, 2008], which also addresses the issue of how to scale Isp and thrust with power. 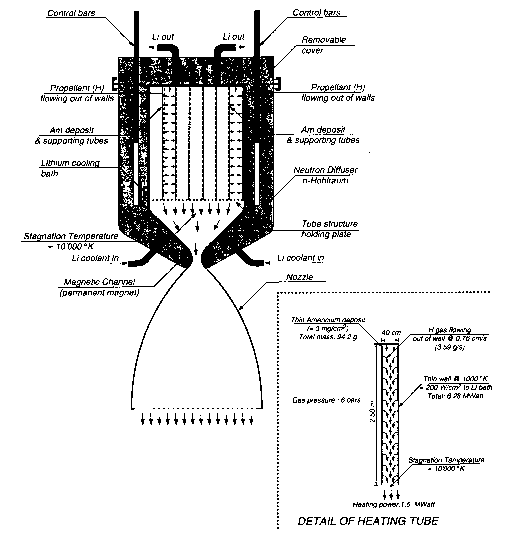 Thrust power scales with (Isp)3, so the higher the desirable Isp to save propellant mass the quicker power reaches tens of megawatts. This theoretical estimate is going to grow with future performance improvements from fusion technology, in particular tokamak reactors (see Chapter 8). In tokamaks hydrogen or deuterium fuel (in the form of H+ or D+ ions) must be injected at speeds that prevent thermonuclear reactions being quenched by the colder gas close to the inner wall. Injection speeds of the order of 4,000 km/s have been achieved. Although tokamak injectors are pulsed, such speed corresponds to an instantaneous Isp of ^400 ks. In other words, a tokamak fuel injector is a form of ion thruster [Fearn, 2008]. An interesting feature of ion engines is that thrust depends on the voltage applied in a rather simple way. Thus, future ion engines may have a degree of control of thrust and Isp at fixed power. This development would enable a thrust vs. time profile optimally tailored to each interplanetary mission. The main tradeoff of all EP thrusters, and of ion engines in particular, is between Isp, mass consumption, and thrust. Mass consumption (and thus overall weight) depends on mission time and Isp; thrust depends on mass flowrate and power. In reality, choosing and designing a propulsion system involves a vast number of these interconnected tradeoffs, and in the end becomes a cost-driven exercise. Because ion engines have already been installed on geostationary commercial satellites, most manned interplanetary missions have been studied or planned around nuclear-powered ion propulsion. This engine technology is mature and space-qualified, but has been always used, by necessity, at low power. For the JIMO mission planned by NASA the xenon propellant ion thruster was in the 16-25 kW class [Randolph and Polk, 2004; Scina et al., 2004], a veritable jump over what was possible in the past using solar cells. The robotic Venus mission being investigated at NASA-Glenn (the so-called RASC Venus mission in [McGuire et al., 2004]), also assumes a nuclear ion engine, even though near Venus photovoltaic power would be twice that available near Earth (the so-called "solar constant'', is 1,300 W/m2 near Earth, about half of that near Venus). Commercial ion engines use the rare gas xenon as propellant. Whether enough will be available for large (nuclear) engines and long missions must be assessed. The world production of xenon is about 59 tons/year, and its price (in 2004) about $1,700/kg. At 1 MW power and 70% conversion efficiency, and assuming Isp is 4,000 s, the consumption of xenon per year of mission would be 13.6 tons, or more than one-fourth of the entire yearly world production. Note that operating an ion engine continuously for 1 year or more is realistic, since under these assumptions the thrust would be only 17.5 N, and the acceleration modest. In fact, a criticism leveled by current NASA Administrator M. Griffin to the JIMO mission, in its version including flybys of Callisto and Ganymede, was that it would consume twice the present world's production of xenon [Berger, 2005b].